CYBORG Cyber Spin, new at Six Flags Great Adventure in 2018. This year is going by at a head-spinning rate. But wait until you see what Six Flags Great Adventure has in store for your head in 2018. The Jackson, N.J., theme park has announced a new ride for the park's Metropolis section, in partnership with Warner Bros. and DC Comics: the Cyborg Cyber Spin. 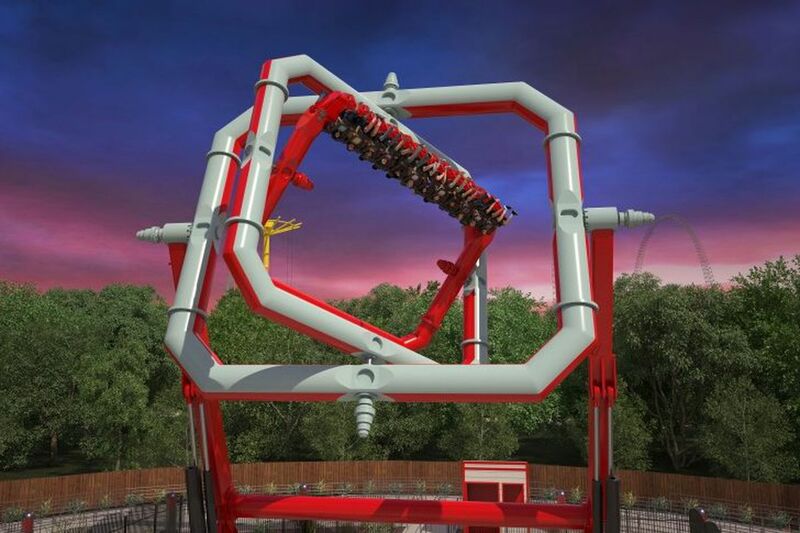 The ride is "inspired by the movement of a gyroscope" and "will deliver an unrelenting and intense anti-gravity experience as it whirls guests on three axes high above the ground," the park said in a statement. With enough excitement to get any kid to put down his cell phone, the Cyborg Cyber Spin will take riders up to 70 feet in the air. And there are floorless seats. Just watching the video made me want to throw up. "Like the Super Hero Cyborg of the Justice League, this futuristic, hi-tech ride will be unlike anything our guests have ever seen or experienced before," park president Neal Thurman said in a statement. The new ride is expected to debut in late spring of 2018. Let me know how it is. I'll be on the ground on the Bugs Bunny Barnstormer.